12.27.2005 - This is a typical example of a pigeon spike installation project. I performed it at an office building. Pigeons were roosting on the ledges above the main doors. They caused the usual pigeon problems - nesting material, feathers, and of course the main problem; lots of pigeon poo. The pigeon droppings fell down onto the ground below, causing unsightly and unsanitary conditions for the hundreds of people who entered the building daily. I inspected the problem and determined that pigeons spikes were the best answer. The concept is fairly simple - the birds are landing and roosting on the ledge. All I have to do is install some sort of deterrent to prevent them from landing and roosting. Several are available, from sticky glue to shock tracks, but the spikes are a popular, effective, and durable solution, so I opted for pigeon spikes. I used a 40 foot bucket lift in order to access these 3rd-story ledges, and installed two rows of spikes on each ledge to get full coverage. Prior to installing the spikes, I cleaned off the debris and droppings with a scouring brush. I then glued the spikes to the concrete with a very powerful adhesive. I can't remember the brand name, but it was stronger than Liquid Nails. This keeps the spikes installed permanently. 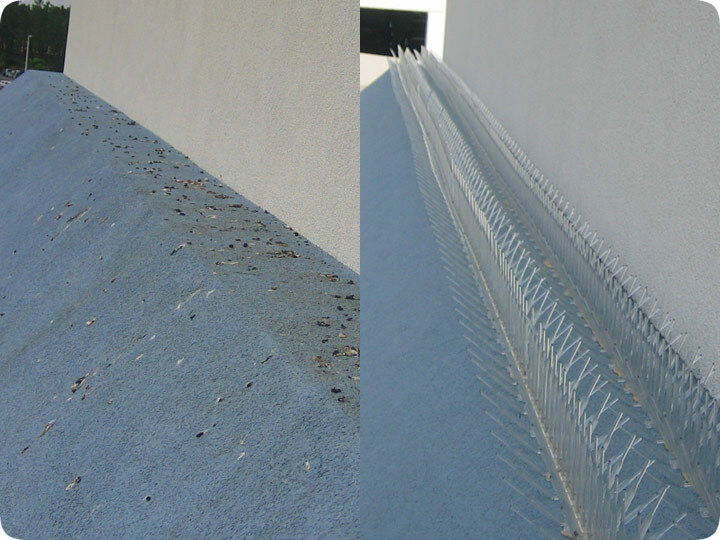 I could have used a large variety of pigeon spikes from a number of different manufacturers. Some are made of thin steel, but these are clear plastic. The strips come in different widths, including 3", 5", and 7" varieties. I had to cover a thick ledge, so I used two rows of 7" strips. I installed them, and the pigeon problem stopped immediately. Now the ledges are pigeon-free, and pigeon poop free, and the people in the building are happy. They used to be sad, very very sad, back when they had to deal with the dreadful pigeons.